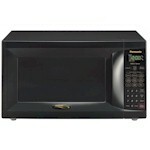 Because there is such a wide range of microwaves on the market, choosing the right one can be difficult. Luckily for the shopper, microwaves have had an evening out of quality over the last few years. As long as you choose a brand name (or get a good warrantee), you can base your purchase decision on type, style, size, power, and features. There are three basic types of microwaves, described below. 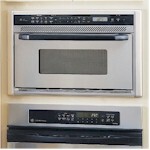 Shown above (left to right), a GE wall-mounted microwave, an Amana over-the-range microwave, a Panasonic countertop microwave. Wall-Mounted – mount in the wall, typically paired with a wall-mounted conventional oven. Over-the-Range – mount over a stove and usually have a built in light and vent on the underside. Countertop – sit on top of a countertop or are mounted hanging from kitchen cabinets. Size – the size of the cooking compartment, usually ranges from 0.7 cubic feet to 2.1 cubic feet. Power – ovens vary in how much power they use to heat food, usually measured in watts. The more power, the faster and the larger the quantity of food that can be heated. Power Settings – almost all microwaves allow the user to cook foods at levels of power below the maximum oven power. Defrosting Settings – use lower power which is cycled on and off to defrost foods. Some microwaves use more sophisticated systems with different wave types to defrost foods without partially cooking them. Preset Buttons – buttons to cook a range of common foods such as chicken, pizza, frozen vegetables, etc. Moisture Sensor – some microwaves have sensors to detect steam which help the microwave determine when certain types of food are done. Rotating Carousel (turntable) – rotate the food while cooking to provide more even heating. Toast & Bake – some new microwaves have built in toaster ovens to crisp the surface of foods as the microwave cooks from the inside. 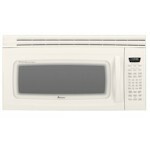 Convection Ovens – some microwaves use a convection heating system in conjunction with the microwave heating. Combination microwaves / convection ovens heat foods much faster than microwaves alone (up to 8 times faster). In addition there is some crisping of the outsides of the food being cooked. Determine the ideal location for the microwave, factoring in cost considerations. While a wall-mounted microwave may provide the best workflow and conserve counter space, a countertop model would cost significantly less. Determine your power needs. If you are typically cooking for one or two people, or if you will use the microwave only occasionally, consider a 600-800 watt model. For large families or heavy users, consider 900-1400 watts.